If you have any way to get access to an established tank. An established tank is one that has been running for a while and is fully cycled. This can be found out by using test kits. Ideally you will want to run the same filter that you will use in your tank you plan to cycle. This can be done by simply placing that filter into the established tank for 24-48 hours this will allow the BB multiply onto the filter media and thus when transferred into your tank it will aid in the process and make It much quicker. With this option you will still need an ammonia source. This can be done with basic fish flakes. Adding a very small amount to the tank will cause them to sink to the bottom and break down slowly creating ammonia. Using pure 100% ammonia you can research your tank size and find carts online that will tell your how much to pour into the tank to reach 2ppm of ammonia which is ideal in starting the process. Fish keeping website www.fishkeeping.co.uk which require you to know the volume of your tank and the daily ppm of ammonia you have chosen in the tank. Using 2ppm is not usually problematic during a cycle and is probably more common. Some choose to use a slightly higher level so they can house more stock when complete, but high ammonia can cause a cycle to stall and play catch up sometimes, so keepers must be aware this option is more difficult to do as you need to make sure you have 100% pure ammonia with no additives as they can be deadly to a tank. Many Janitor supply stores have these for sale it is sometimes referred to as “janitorial ammonia”. Test the water every 24 hours and wait to see the ammonia reading drop. At this point the filter contains bacteria that break down ammonia into nitrite, so the cycle has commenced. Keeping a cycling diary is recommended so you can plot the changes/patterns emerging. Adding your source of ammonia again and then now testing for nitrite and ammonia and charting results see above chart to understand where your aquarium is in the cycle process. Wait until the nitrite level drops (It will be high for a few weeks) continuing to add ammonia to feed the bacteria in the tank every day. Nitrite is the strange in that once it begins to drop it will continue to hold at a very level lower until the full cycle process has taken place in the aquarium. 7. Continue to add your ammonia source up until you add your fish or shrimp. Otherwise you may lose all your hard work! This entry was posted in Shrimp Tank Setup on January 17, 2014 by Ryan Curtis. This entry was posted in Shrimp Tank Setup on April 1, 2011 by Ryan Curtis. This entry was posted in Shrimp Tank Setup on March 31, 2011 by Ryan Curtis. This entry was posted in Shrimp Tank Setup on March 28, 2011 by Ryan Curtis. We went searching for the perfect complete package to start a shrimp fish tank. And we ran into the Fluval Ebi! The Fluval Ebi is the complete package to setup a shrimp tank whether you are a beginner or an expert! The 7.9 Gallon all glass aquarium is completely made out of glass, and has bent corners for full viewing! It included everything you need to get your shrimp habitat started, such as a 13 watt daylight compact fluorescent light, an Ebi Internal Filter with spray bar, Fluval Shrimp Stratum substrate, a molded rock background, telescopic shrimp net, thermometer and sample sized Fluval Shrimp Safe, Fluval Shrimp Mineral Supplement, and Fluval Shrimp Granules. 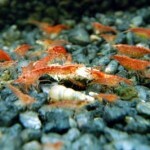 You will also get the Fluval shrimp Care guide to walk you through the setup and how to care for your new pets! To buy the Fluval Ebi, Click Here. Of course we have live shrimp for sale once your tank is all setup! This entry was posted in Shrimp Tank Setup on March 1, 2011 by Ryan Curtis. This entry was posted in Shrimp Tank Setup on April 20, 2010 by Ryan Curtis.